Think of this book as Sudoku for navigators. Each volume contains 12 navigation challenges that can be completed without leaving home but will test your skills at plotting and taking compass bearings, plotting and taking UTM's as well as reading terrain from contour lines. The challenges will enhance the users understanding of map symbols and features while they complete a virtual adventure race. 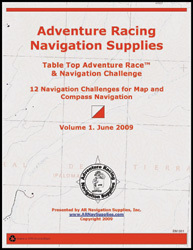 The book comes with complete instructions, 12 USGS map sections, 132 challenge questions and help with common navigation techniques and adventure racing terms. These navigation challenges are set up so as they can be completed from anywhere in the World. You can complete the challenges from the comfort of your own home, in your office, while traveling and even on the plane. All you need is a compass or protractor, 1:24,000 UTM tool or Basic Roamer AR and a pencil or fine pen. Each challenge is self-contained and has its own set of instructions. The individual navigation challenge instructions are like the rules of travel that you will receive at a race. These rules of travel must be followed to find the locations of each of the CP's on the map. Each CP has a question that must be answered before you can move onto the next location. The answer to each question should be written in the space provided to prove that you have found the correct location. The navigation challenge also contains a significant help section that will guide you through the most common map and compass navigation techniques. Topics covered include reading contour lines, plotting UTM's, taking bearings and keys to the USGS map symbols. Volume 2 - More advanced topics including declination, route choice, triangulation and time distance calculations.